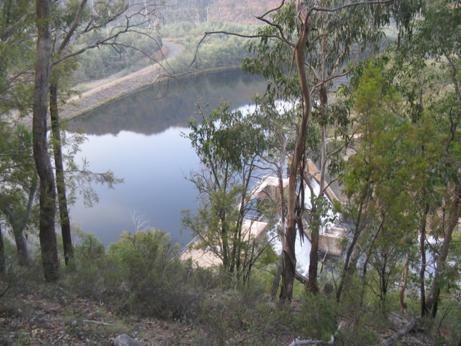 Swingler’s ‘Portal’ on the Upper Thomson River: This is the type of weir which could be built CHEAPLY on a number of other rivers (Aberfeldy, Macalister, Barkly, Moroka, Wonnangatta, etc) to increase (Read: ‘DOUBLE’) Melbourne’s water supply by diverting some of the surplus winter flow. As you can see it takes up only about an acre! No flooding of ‘wild rivers’ etc. Of course you would need to construct ‘fish ladders’ and diversions for canoeists, as well as supply tunnels. (You have to walk in @ 2km off the Marshall Spur Rd off the Thomson Valley Rd behind Mt Baw Baw to see this weir – a worthwhile walk. (PS Ignore the ‘Keep Out’ signage). Such weirs could be easily paid for by dredging the billions of dollars of gold still along the Jordan’s alluvial flats. This might also help eradicate the dreadful blackberry menace there. They are @ 12’ high with trunks as thick as your wrist. There are few places even where deer can push through them (VERY good shooting spots if you are hound hunting)! In such a spot, as they burst through the tunnel startled by the hounds, in Poole’s Gully nearby on the Jordan, an old (departed) friend of mine Arthur Meyers, shot three trophy stags in as many minutes in 1962, (laying them down next to each other like lovers) one of which remains the largest sambar stag ever taken in Australia! Very few people have ever seen this monster trophy – I wonder what became of it after Arthur’s passing?